Interview between Charlie Avis, Public Information Officer for the Secretariat of the Basel, Rotterdam, and Stockholm Conventions, and Dr. Ahmad Khan, Director of the Basel Convention Regional Centre for the Caribbean, located in Port-of-Spain, Trinidad & Tobago. Charlie Avis (CA): Good morning Dr. Khan and thank you for your time to answer our questions: your Regional Centre is the next in a new series whereby we put one Centre per month “in the spotlight” in order to highlight all the many ways the Regional Centres contribute to the implementation of the conventions. Ahmad Khan (AK): Thank you Charlie for this opportunity to share our work with a wider audience! CA: Firstly, please tell us a little bit about the Regional Centre (RC) itself. Where are you housed, how many staff do you have, and when was the RC established: basically how did the Centre come about? AK: Charlie, the Caribbean BC Regional Centre was first established as a “desk” at the Caribbean Industrial Research Institute (CARIRI) as early as 1998 but as time passed and more responsibilities were placed on the Regional Centres by the Conference of Parties, the Caribbean Regional Centre evolved into a fully autonomous regional institution. By 2008, the Centre had the legal authority to enter into contracts, hire staff and own its own physical assets and is now located at its leased premises in Port-of-Spain. 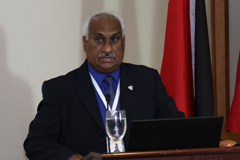 The financial support for the centre is provided by the host country, the Republic of Trinidad and Tobago. Its current staff complement is ten persons - three administrative staff, six professional staff and one chief cook and bottle washer! CA: Now, please tell us, the Caribbean is a large and diverse region, made up of many countries which differ from one another in many ways. Do you serve all of the countries of the Caribbean, how many Parties are there, and how do you manage with the languages: Spanish, English, French, Dutch? AK: The RC serves all the parties to the Basel, Rotterdam and Stockholm Conventions in the region and we have already started to serve those countries who have signed onto or are intending to ratify the new Minimata Convention. So far there are sixteen countries that are served in various ways by the Centre. These are Antigua and Barbuda, Barbados, the Commonwealth of the Bahamas, Belize, The Republic of Cuba, the Commonwealth of Dominica, Dominican Republic, Haiti, The Republic of Guyana, Grenada, Jamaica, The Federation of St Kitts and Nevis, St Lucia, St Vincent and the Grenadines, The Republic of Suriname and the Republic of Trinidad and Tobago. The operating language of the Centre is English but we do translate our educational material into Spanish, Dutch and French as needed. Our main activities are Training and Technology Transfer and thus far we have had only limited challenges with the differences in language between our member countries since most of the professional staff at the Ministries and Agencies in each country with whom we are in direct contact are often bi- or multi-lingual. Some of the staff at the Centre are bilingual English and Spanish speakers as well so this helps with our communication with our member countries. AK: The focal areas of the Caribbean Regional Centre are defined by our member countries on a biennial cycle, during our annual Steering Committee meetings, and are mainly on building technical, institutional and legislative capacity in each country for the environmentally sound management of wastes and chemicals. Charlie, the priorities for the Caribbean over the next two biennial cycles (2016 – 2019) lie in the effective management of waste lubricating oils, electronic wastes, waste pneumatic tyres, industrial chemicals, lead acid batteries, obsolete pesticides, persistent organic pollutants, mercury and municipal wastes. It sounds like quite a mouthful but we are actively pursuing an agenda to institute a regional collaborative system for integrated waste and chemicals management with our member country partners to reduce the generation of wastes at source, to institute sustainable resource recovery measures and to institutionalize on a regional basis novel technologies for waste and chemicals recycling using the public sector/private sector/civil society collaborative approach. In short Charlie, our bottom up approach to serving our member countries’ needs have allowed us to overcome a number of challenges except one critical one and that is sourcing funding for implementation of projects and programmes in a timely manner. CA: So I understand one specific area of focus for the RC is on e-waste, in relation to assisting parties fulfil their obligations under the Basel Convention. What would you say is the level of awareness amongst the general public in the region concerning e-waste? And amongst policymakers and decision-makers? AK: Charlie the e-waste situation in the Caribbean is like La Soufriere in Montserrat, the peak gets bigger and bigger as time goes on. This is because the Caribbean in general is consumer driven when it comes to mobile phones, computers and other ICT equipment….everyone must have the latest and hottest gadget! In addition some islands have even instituted policies to provide free laptop computers and tablets to every student entering a secondary school or tertiary educational institution all of which come back as waste within three to five years. Regrettably, the level of education and awareness of the e-waste problem by both the policy and decision makers and the population in general is not yet at a stage where this toxic and hazardous waste stream is given the attention it deserves. We at the Centre have produced brochures and newsletters to enhance the level of awareness of all stakeholder and interest groups in the islands. But what we expect will work best for us is when we have finally been able to establish sub-regional e-waste refurbishment, disassembly and material recycling facilities to remove this waste stream from our landfills, waterways, beaches and backyards. It is important to note that the Caribbean may be diverse and extend over quite a large acreage of space but our population size is at best 17 million people so the economies of scale hamper what we can do by way of investment in recycling facilities. For instance, when the precious and semi-precious metal containing components are recovered from waste electronic equipment, we can only hope to be able to broker this on the international market rather than set up metal recovery facilities. The latter option is too costly and not sustainable in relation to the volumes of e-waste generated within the entire Caribbean region. CA: Let us now consider the wider region served by the RC. How do you liase with all these other countries, who are your partners on the ground there, and what kinds of activities do you carry out in-country? AK: The BCRC-Caribbean works with our member countries in two ways. We work primarily through the political and technical Focal Points of the waste and chemicals conventions in government, in each country. But the BCRC-Caribbean is also fortunate to have a very competent and knowledgeable Steering Committee which is comprised of representatives of the fourteen countries who are parties to the Basel, Rotterdam and Stockholm Conventions. These fourteen ladies and gentlemen ensure delivery of our services on the ground in each country but also bring back to us the issues of priority concern for each country and assist us in developing work programmes to address these. Our services for now are essentially project driven but we have also conducted workshops and seminars on topics related to e-waste management, on waste oils management, on used lead acid battery collection and disposal, on waste tyres recovery and recycling, on NIPs updates, on Mercury assessments and on industrial chemicals and obsolete pesticides management. AK: I cannot identify a single achievement that stands out but I think in developing our delivery of services to the region, we have been successful in creating networks with the public sector, the private sector, the business communities and civil society groups which work well with us and through which we work effectively. Our medium term goal is to expand that network and to encourage these four groups of stakeholders to collaborate and cooperate on projects and programmes aimed at improving the environmentally sound management of wastes and chemicals in the region among themselves and for us to eventually take on the role of “facilitators of the process”, providing technical support and advisory services as required. AK: The next 5 to 10 years is a very important period for the Caribbean region as it moves towards firstly adopting the Sustainable Development Goals and then integrating these into national policy, planning and legislation. In the short term, I see the BCRC-Caribbean working towards aligning the environmentally sound management of wastes and chemicals into some of the relevant SDGs and by extension assisting the countries we serve in achieving higher degrees of compliance and implementation of the wastes and chemicals conventions and protocols. But more importantly in the medium to long term period, I see the Centre increasing its capacity to develop projects, source funding to support the implementation of these projects and executing them on behalf of our Caribbean partners and at the same time building capacity in the region and in individual countries so that they can eventually take ownership to do it themselves. CA: Dr Khan, how did you come to lead this RC, how did your career lead you this in your direction, and what advice would you have for other Trinidadians, male or female, striving for a career in science and international development? AK: When you embark on a career in a small island developing state you invariably become a jack of all trades because of the limited human resource capital in these types of countries. I came to this job after developing a career in waste and chemicals management in the region so I think I brought some experience in the field with me. But I started out as an environmental scientist with an emphasis and interest in marine pollution and oceanography in a marine scientific research institution. I moved away from applied research fairly quickly and became an environmental management professional in an integrated oil and gas company. This transition allowed me to move my career from being an applied scientist into the management and engineering disciplines. I took that experience and training with me to the private sector and further development my career as an environmental management practitioner in a consulting environment. I think the fifteen years spent in the consulting business made me an expert in nothing but knowledgeable in a little bit of everything….so here I am now coasting to retirement…..
Charlie, I think the most important thing I can share with young men and women in the region, who are interested in a career in science and international development, is to keep the focus on what you want to achieve in life. Scientific knowledge is evolving almost on a daily basis and as professionals we must recognise that science and technology can provide a pathway to do so much good for so many people with so little effort. I have always held the view that the more we learn as an individual, the greater is our responsibility to improve the quality of life of our fellow human beings and I’d like to encourage others to adopt the same philosophy. CA: And lastly, please, what do you think are the most pressing, emerging issues will be for sustainable management of chemicals and wastes in the Caribbean, in the next years, and how well is the region equipped to meet those challenges? AK: This is a difficult question to answer Charlie since the region has a diverse economic base. For the larger and more industrialized islands like Trinidad and Tobago, Dominican Republic, Barbados, Cuba and Jamaica, the main challenge will be to integrate waste and chemicals management into national environmental policy and legislation and then to enforce the provisions in law so created. It will also be important to stimulate economic activities in waste minimization, resource recovery and recycling in these countries. For the smaller islands whose economies are more dependent on tourism, commercial enterprises and agriculture, the main challenge will be to ensure that all wastes and chemicals generated at the municipal level are properly handled and disposed of in such a manner to minimize impacts to human health and the environment. For these islands, the preservation of living and non-living natural resources is of paramount importance since these resources are the drivers of the local economies. As a region the Caribbean is strong in having the capacity to identify and develop programmes and activities to address its priority issues on wastes and chemicals management but its limitation in capacity to fund and implement programmes and activities has to be strengthened. In the next three years the BCRC-Caribbean will be working with at least eight of the islands and territories in the region to build capacity to achieve these objectives. CA: Thank you, for your time and for your answers. Good luck with your important work in this important region, and I hope we shall be able to meet in person at the UNEA2 in Nairobi next month? AK: Thank you, Charlie, and if you need any further information on our centre and its activities, please go to our website www.bcrc-caribbean.org.